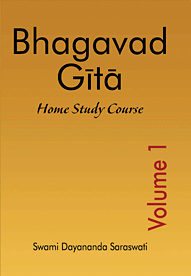 Swami Dayananda's Bhagavad Gita Home Study Course is an edited transcript of classroom talks of Pujya Swamiji. It is a unique set of 9 books of over 4000 pages which goes comprehensively through all the chapters and verses of the Gita with a word to word translation in English from Sanskrit and an elaborate explanation of Swami Dayananda based on Sankara's commentary. Each verse is unfolded with clarity in such detail as to make the reader feel he/she is sitting in the class room.